Bill is an award winning, versatile caricature artist with a background in Marvel Comics and the advertising/film industry in NYC. He brings more than 15 years experience drawing caricatures at numerous corporate and private parties in NYC to the greater Phoenix area, including Scottsdale, Chandler, Glendale, Sedona and Flagstaff, AZ. His caricatures are very popular at parties / events as: - Friendly caricature (no embarrassment on your big nose) - Draws people doing their favorite activity! - Add a theme, such as superhero, Wild Wild West, fairytale, particular historical era, cultural festivity, etc. He works with you to make your parties / events successful: - Black and white or full color - Head only or with body - Any party from the most upscale formal banquets and corporate events to casual backyard parties - Accommodate a large number of guests with a pre-drawn background; or - Draw fully customized caricatures in private occasions - Provides a plastic sleeve for customers to take their caricatures safe home. His past clients have consistently been pleased by Bill's artistic ability, professionalism, and good rapport with people of all ages, especially kids. 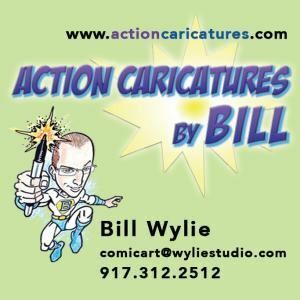 CORPORATE PARTIES EVENTS - Add excitement to your corporate parties and events with Action Caricatures by Bill! His caricature attracts people at promotions, trade shows and open houses. He can draw on a paper with your company logo or event title. For schools and colleges, he does homecoming, student events and graduation parties. His recent clients include: McAffee, Ogden Visitors Bureau, Northern Arizona University, TD Bank, Goldman Sachs, Bloomingdales, LIU C. W. Post, Columbia University, Lord & Taylor, Mercy College and Bloomberg. PRIVATE PARTIES - Entertain your guests with caricatures at birthday parties, weddings, anniversary parties, communion parties, Bar/Bat Mitzvahs, Sweet 16, baby showers, and family celebrations. Bill will help you make kid's parties fun and memorable with themes such as, superheroes, princess, animals, cartoon characters, dinosaurs, rock stars or spaceships!